Last month, I took a trip back to New York City to eat all the vegan things and catch up with my peeps. 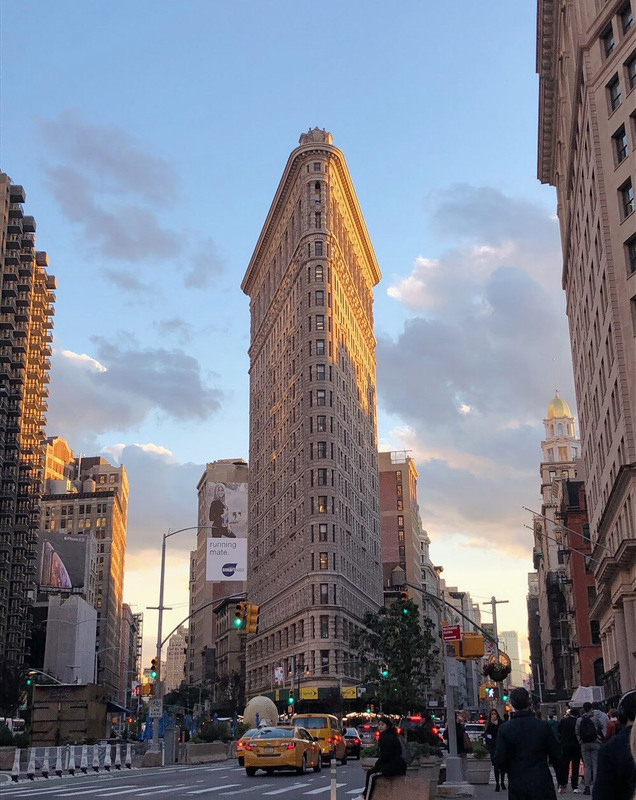 It’s been two and a half years since I moved away from the city, but I still know Manhattan like the back of my hand, and I meticulously planned each day with three or four restaurant stops and plenty of exploring on foot (20,000 steps per day!) in between. It’s always interesting to play tourist in a city that you used to live in. 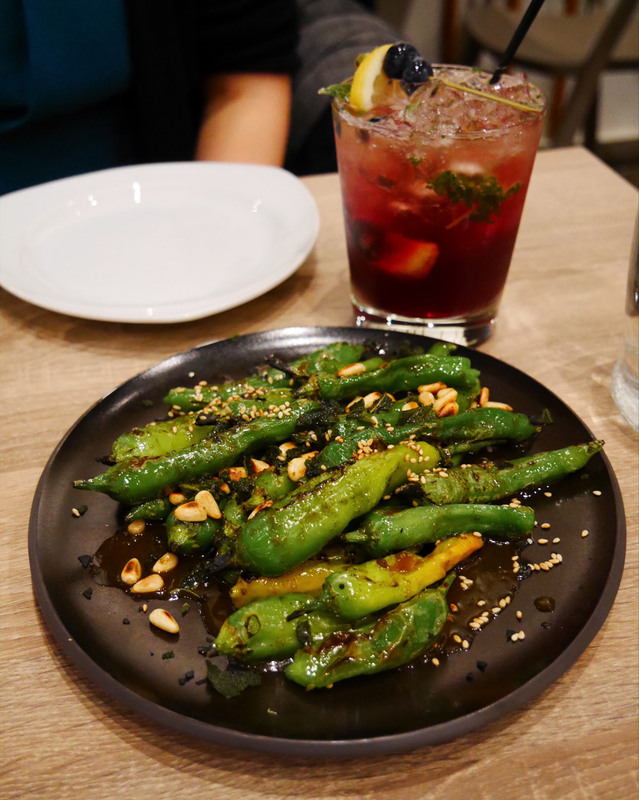 My New York City vegan eats list combined old favorites with new hot spots, and even with four full days to indulge, it was nowhere near enough time to cover it all. Scroll down for all the spots I hit up on this trip and try to keep up with me, if you can! If anyone is curious, here are some other places that I, unfortunately, didn’t manage to squeeze in this time around: Dirt Candy, Candle Cafe, Hartbreakers, Sans, Very Fresh Noodles, Arata, XYST, and Plantmade. First stop: Orchard Grocer! Located right next to vegan shoe store MooShoes, Orchard Grocer is an all vegan deli and mini market. I browsed the store before, but this was the first time I’ve tried their sandwiches. I went for the classic Bowery breakfast sandwich with a turmeric tofu egg, tempeh bacon, Violife provolone, and spicy mayo. 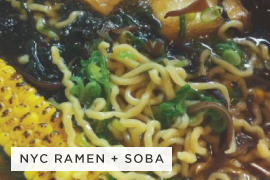 Eating my way through the NYC ramen scene was one of my favorite hobbies, so I had to make a ramen stop on this trip. 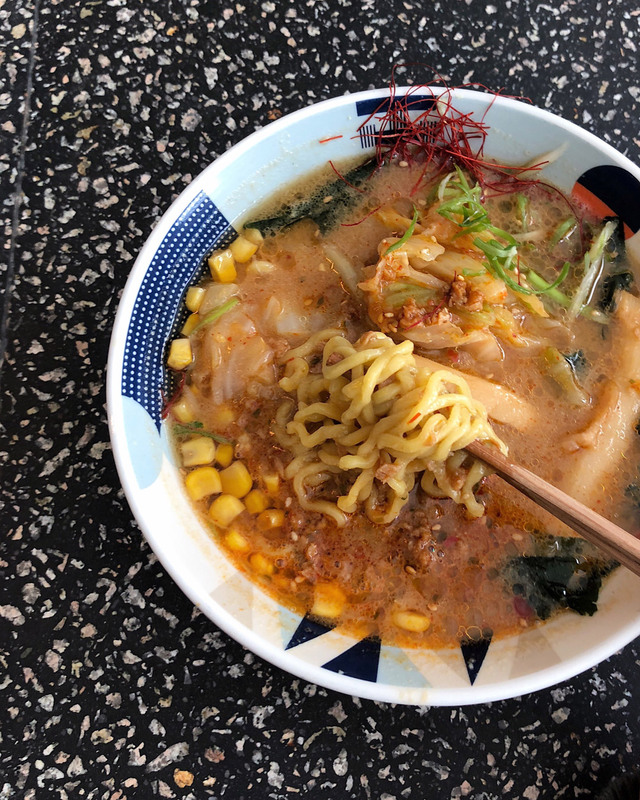 Tochin’s vegan miso ginger ramen is topped with soy meat, menma, cabbage, bean sprouts, and shredded red pepper. 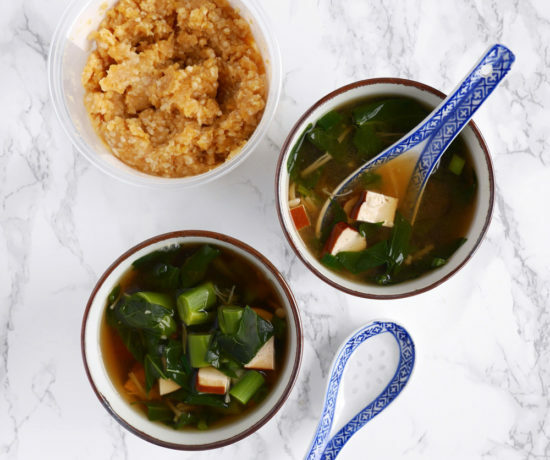 The broth is so satisfying and offers a hint of heat. I ordered a small bowl, which was still a really hefty bowl of noods. Shortly before I left NYC in 2016, I heard that Terri‘s Craig Cochran was working on P.S. 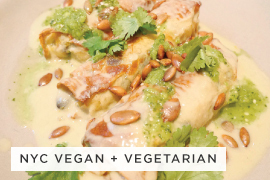 Kitchen, an upscale vegan concept that donates all its profits to social and sustainable charities. After following the P.S. 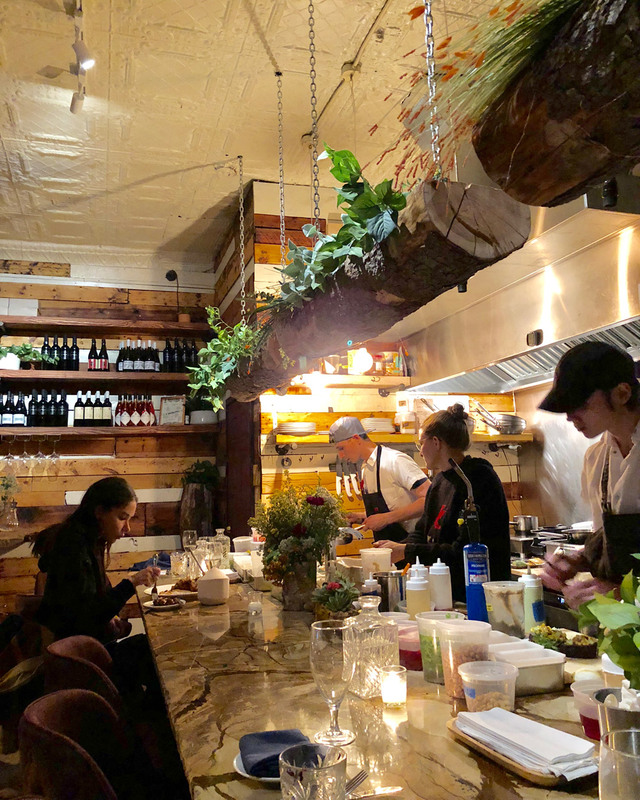 Kitchen journey on social media, I finally got to visit this vegan gem in Hell’s Kitchen. 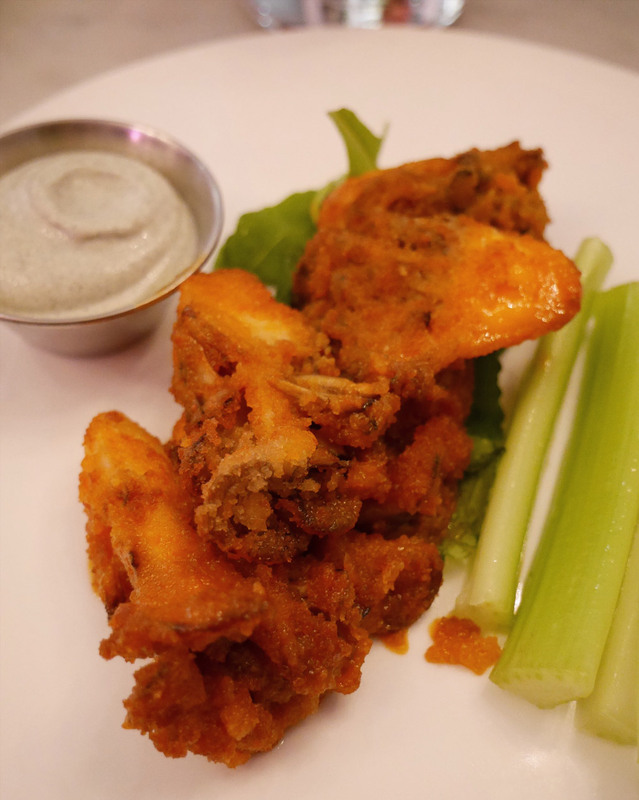 The buffalo maitake wings were perfection, and the PS. I Love You was an excellent pre-dinner cocktail. Beyond Sushi is an old favorite of mine, and if you plan to visit, I recommend the 37th St flagship location as they offer cocktails and small plates to complement their sushi. 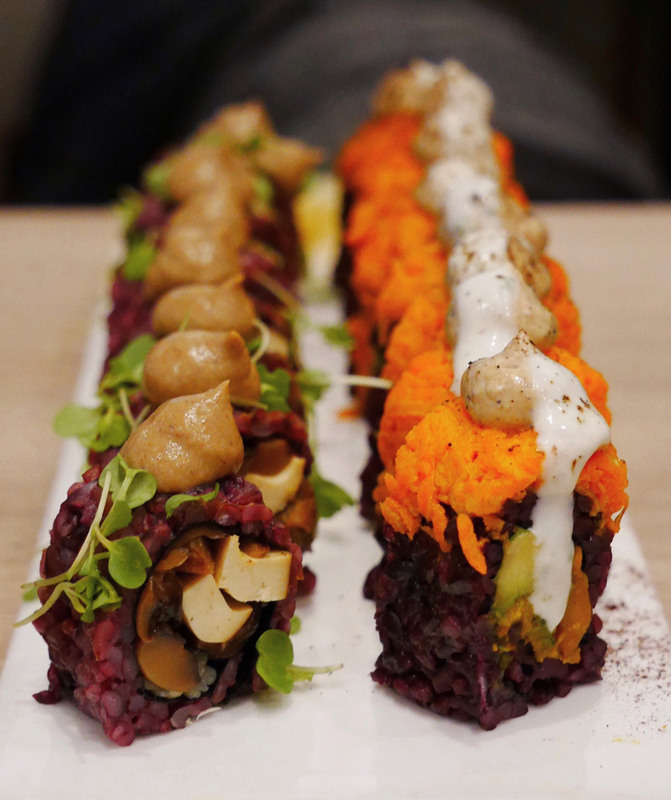 Angela and I started with the yuzu shishito and scorched broccoli and cauliflower, then moved on to my go to mighty mushroom roll and a seasonal roll that looks a whole lot like Halloween. Congrats to Guy Vaknin and the Beyond Sushi team on their recent Shark Tank win — they’ll be expanding to the west coast soon! 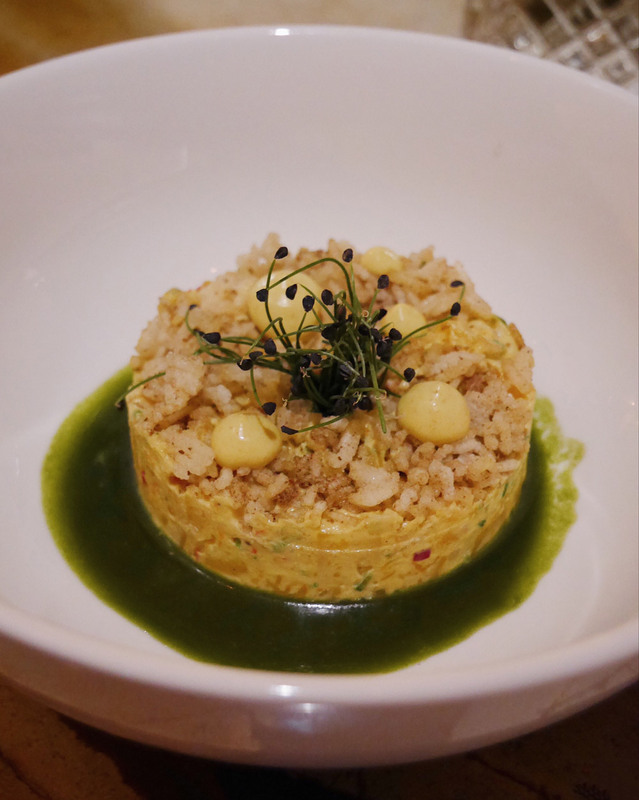 Nestled in the heart of West Village, Delice & Sarrasin is a quaint vegan French restaurant. I realize that the words “vegan” and “French” almost seem like they shouldn’t belong together because traditional French cuisine is so meat-focused, but Delice & Sarrasin is so damn good. 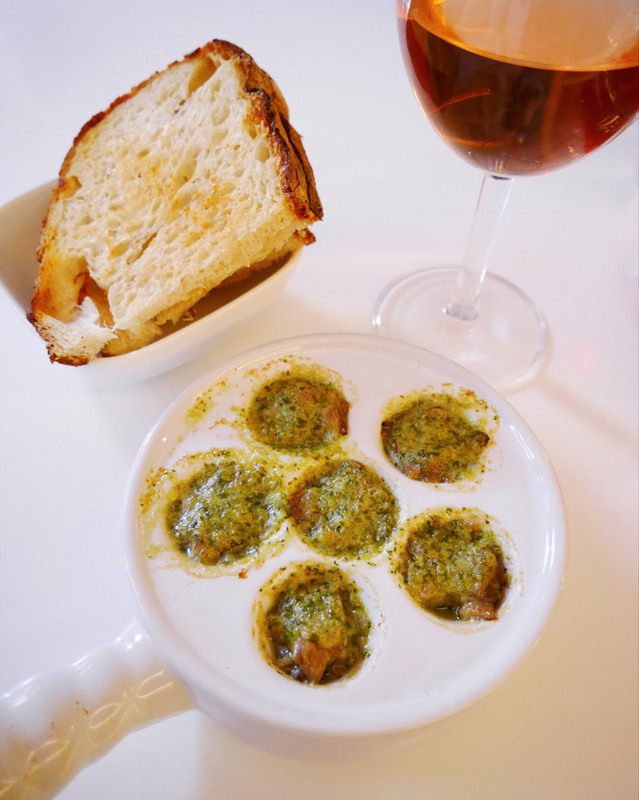 I paired a glass of rose with the escargot with a coconut-based garlic butter, where snails are replaced with oyster mushrooms. 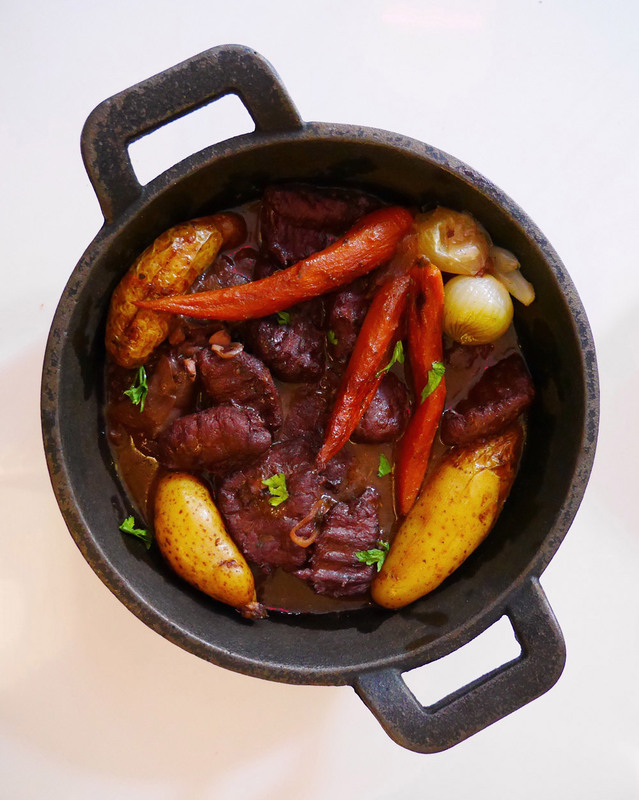 It was tough deciding which entree to order, but the boeuf bourguignon with pea protein was a winner. 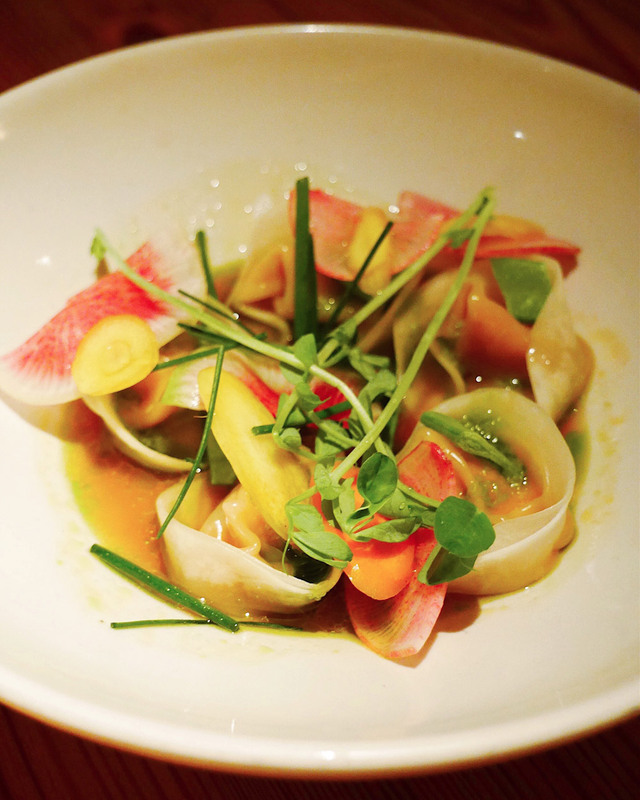 The one and only Jean-Georges Vongerichten opened a fully vegetarian restaurant, and it is amazing. 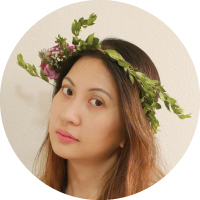 I visited in 2017, but never got around to write about it (ugh, procrastination got the best of me). Every bite I’ve had here is fabulous. I didn’t get a chance to eat here this time, but I was lucky enough to grab a seat at the bar and rest my feet during prime dinner hours. 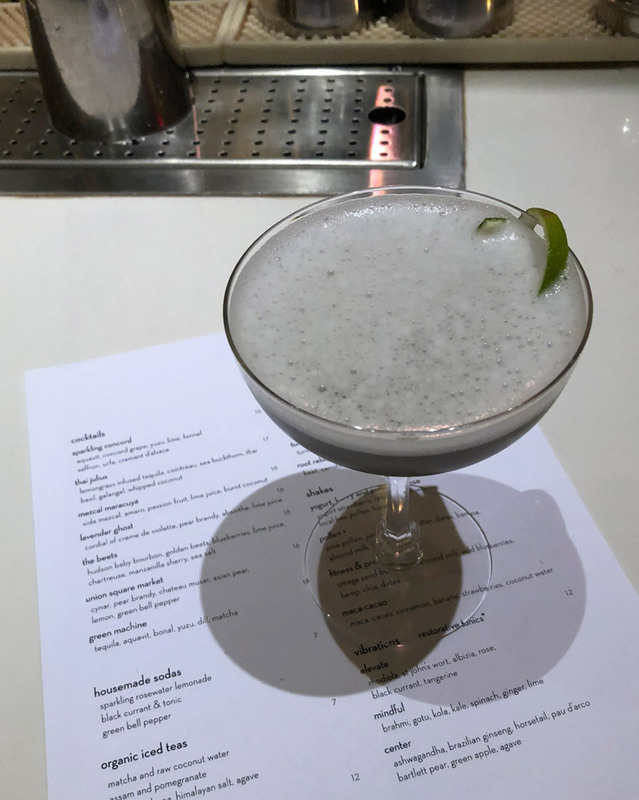 The lavender ghost cocktail is one that will haunt me for a while because its one of the most unique cocktails I’ve had this year. This is one of my top three restaurants in NYC. 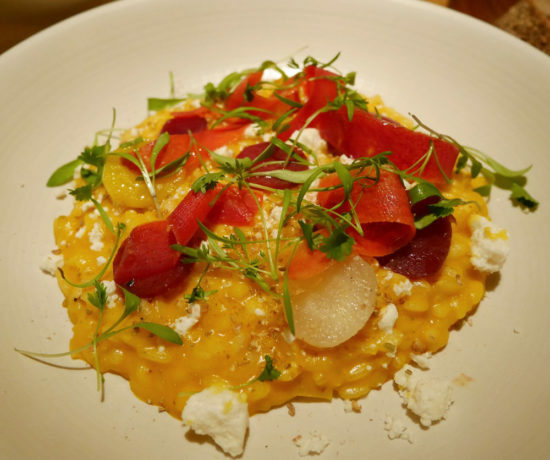 At Nix, John Fraser of Dovetail and Narcissa celebrates vegetables in beautiful and flavorful plates. Joe, Noah, and I shared tandoor bread and dips (the avocado ginger and mint! 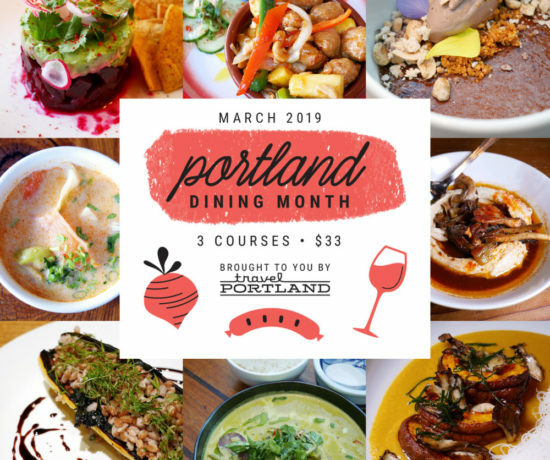 ), the signature cauliflower tempura buns, sweet potato and ginger dumplings, baby eggplant with red lentil curry, and an incredible grilled half pineapple with coconut cream. Every omnivore I’ve brought here has left impressed. 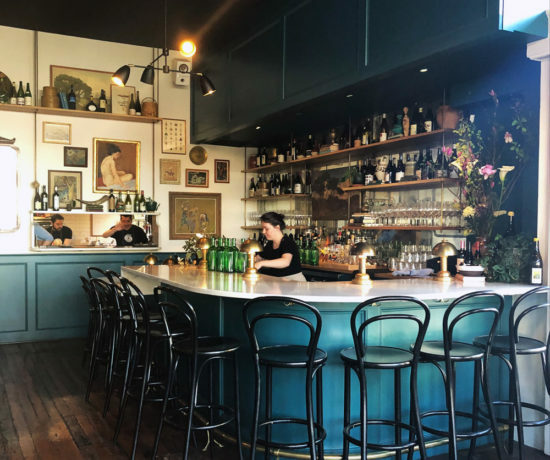 It’s no wonder that Nix holds a Michelin star. After years of being online friends with Julia of Sweet Escapes, we finally met in person. I suggested that we meet at Jajaja for lunch, and funnily enough, she was planning to suggest Jajaja too. Fun fact: the chef who helped veganize GustOrganics (a.k.a. 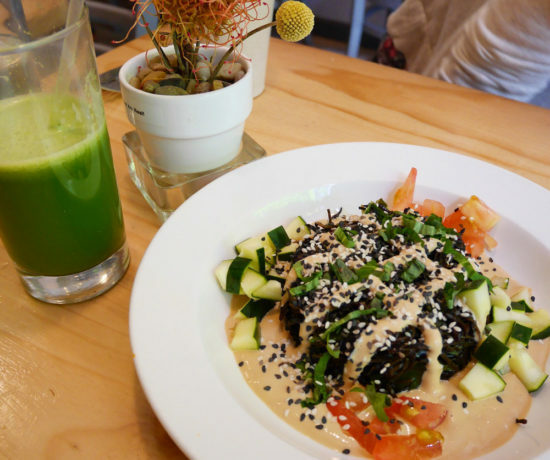 the original Veganizer project) is now making vegan magic at Jajaja. 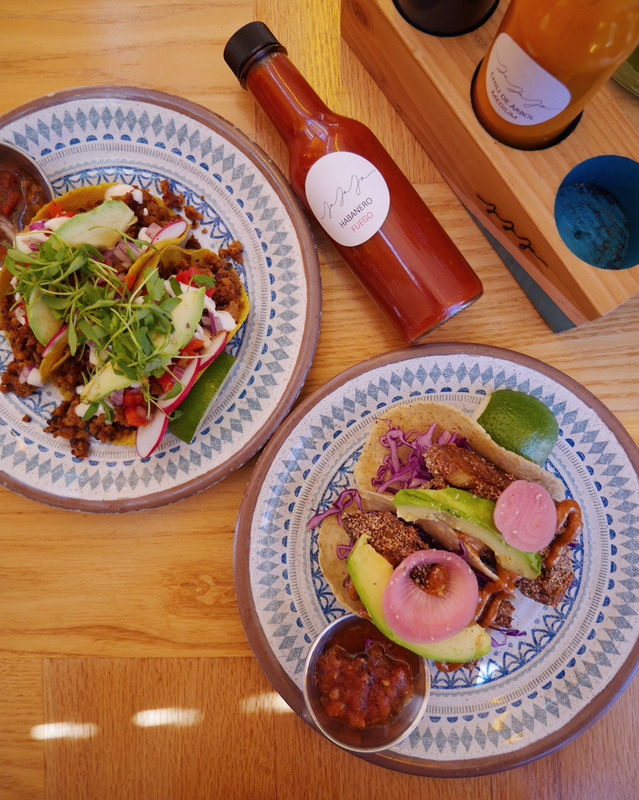 The colorful interior is a blogger’s dream come true, and this might be the best contemporary Mexican food I’ve had. 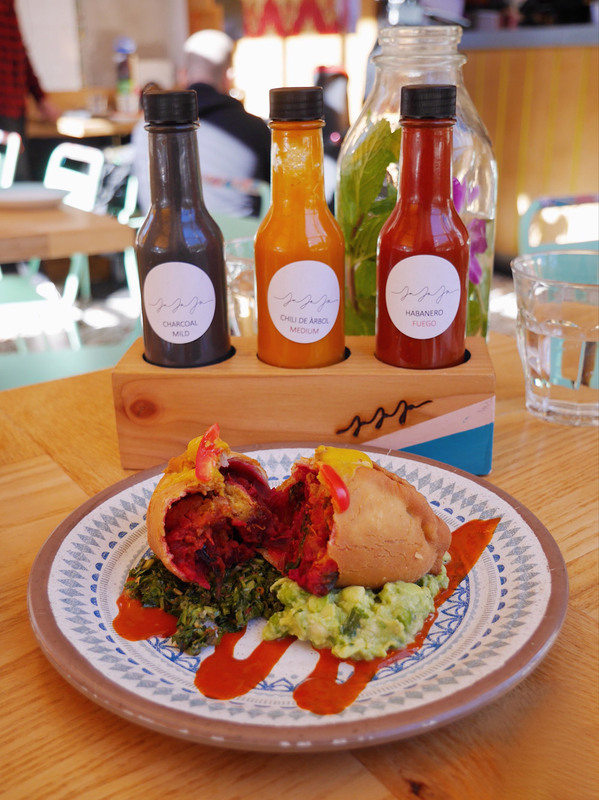 We shared the beet and pumpkin empanada, crispy choyote fish taco, and the chorizo taco. 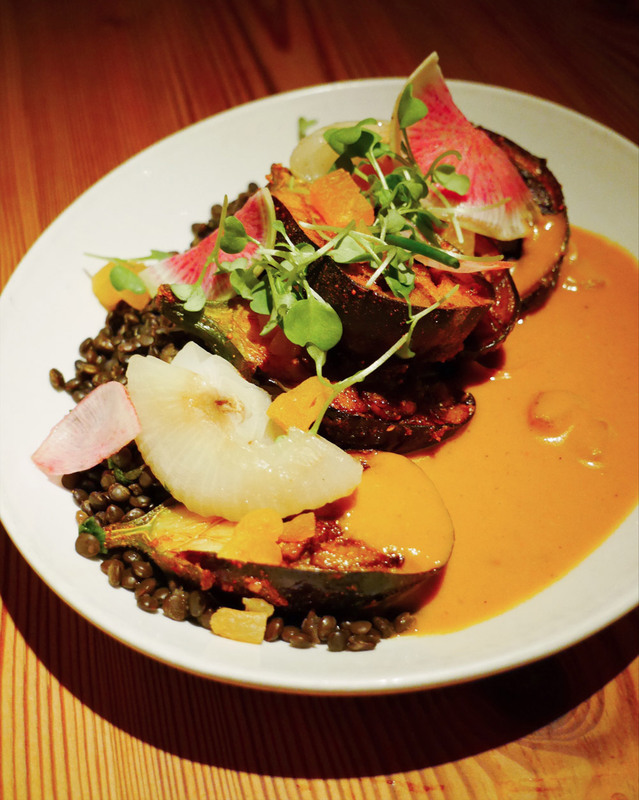 When Ravi DeRossi opened Avant Garden, he announced that he had plans to get all 15 of his restaurants and bars to go vegan. 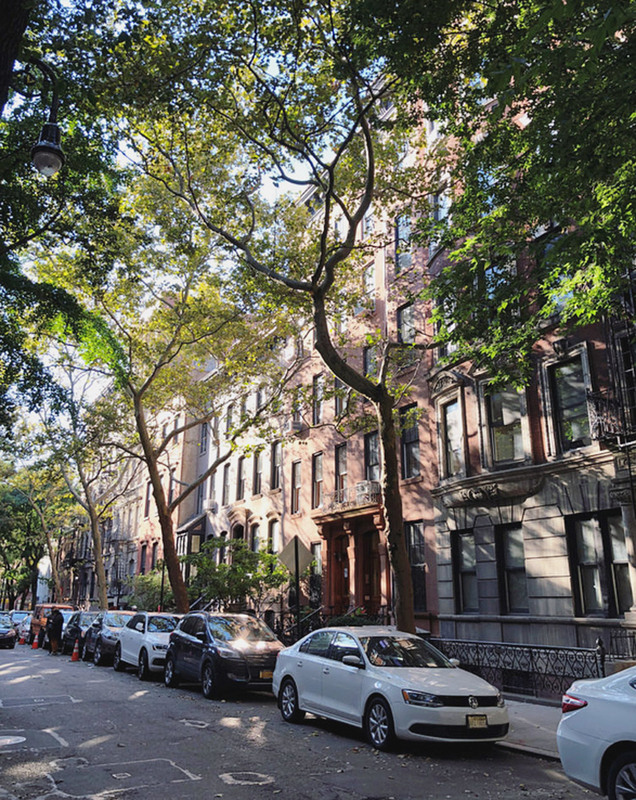 It’s no secret that I’m a big fan of the original East Village location, and the newer Williamsburg Avant Garden is equally as lovely. On weekdays, they offer a $35 three-course dinner, which allowed Brian and I to sample every category of the menu. 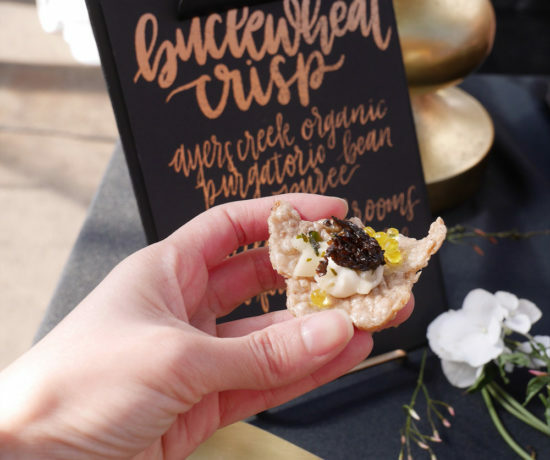 Some highlights include: butternut squash with puffed rice and curry aioli, half avocado tempura with crispy rice cake and miso glaze, the scorched cauliflower with fried capers, and porcini and portobello duxelle with caramelized onion puree. 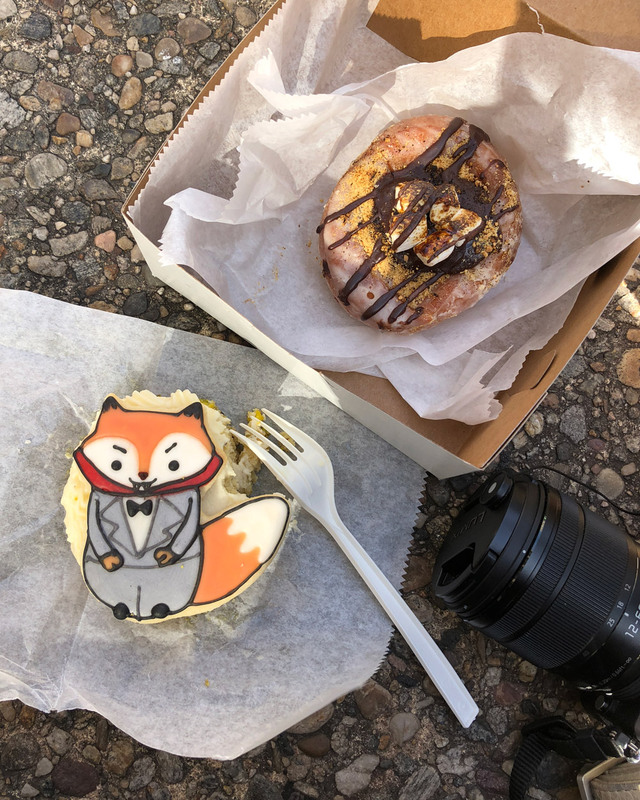 I had plans to stop by The Pennsy to grab a donut from The Cinnamon Snail, but I couldn’t say no to the adorable pistachio vampire fox cake with cardamon buttercream. The cake was perfect, and Mr. Fox is as delicious as he is cute. 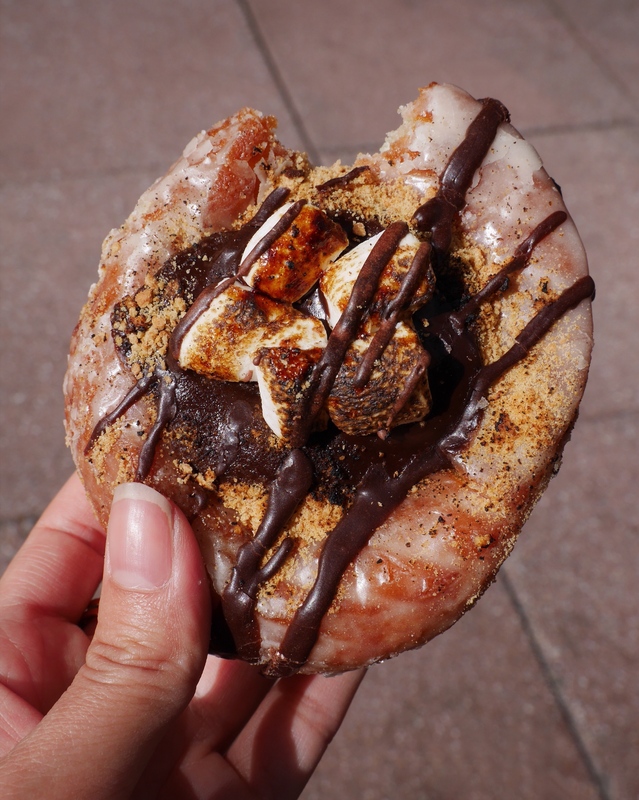 I also treated myself to the chocolate ganache stuffed s’mores donut. I don’t normally eat sweets… unless I visit The Cinnamon Snail because Adam Sobel is a vegan baking extraordinaire. Angela, Hannah, and I spent Friday afternoon window shopping through Soho, one of my favorite touristy things to do in NYC. 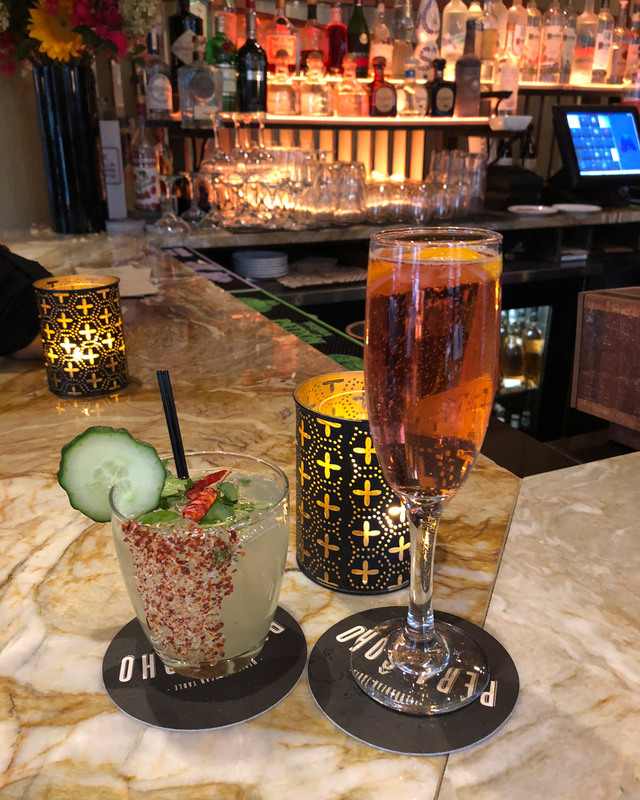 When we needed a place to sit, I remembered that Pera Soho was in the area, and we should be just in time for happy hour. Hello Soho blossom! A trip back to NYC means dim sum! 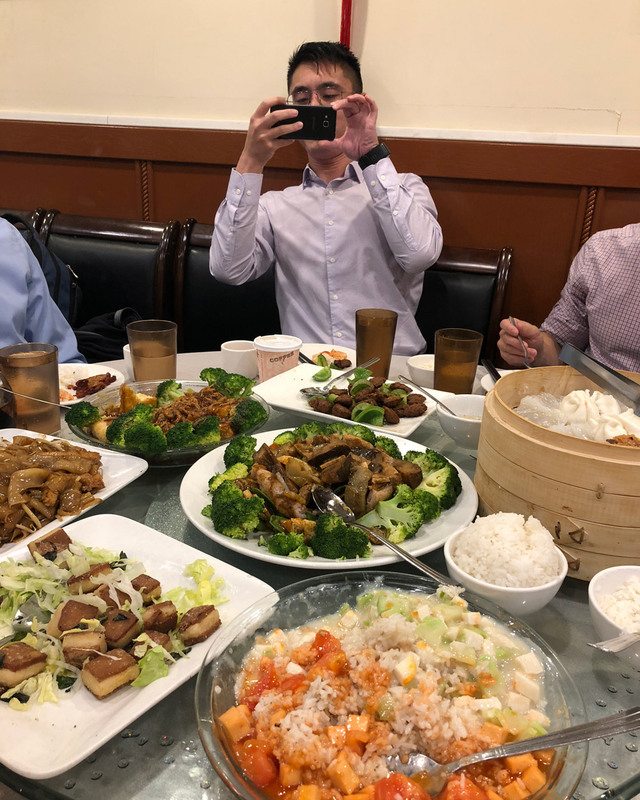 Also, my architecture school friends have a habit of celebrating birthdays with dim sum (and as always, I got a photo of Ken taking a photo), so this was a two-in-one meal. After all these years, the extensive menu at Buddha Bodai is still overwhelming, and my vegan dim dum cravings were satisfied even though they were out of turnip cakes that evening (noooo!). 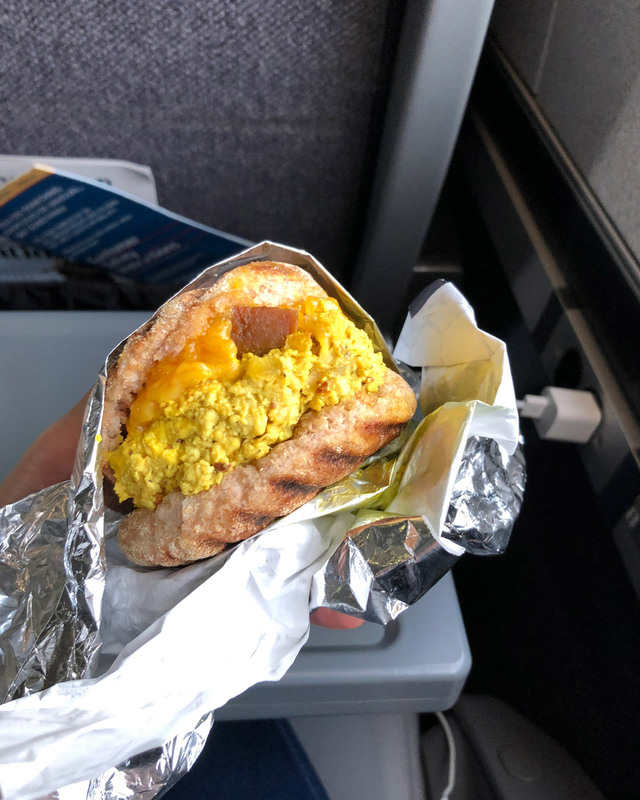 Last, but not least, I hustled to Terri to grab a green smoothie and the sausage, egg, and cheese breakfast sandwich to go before boarding the Amtrak to DC. 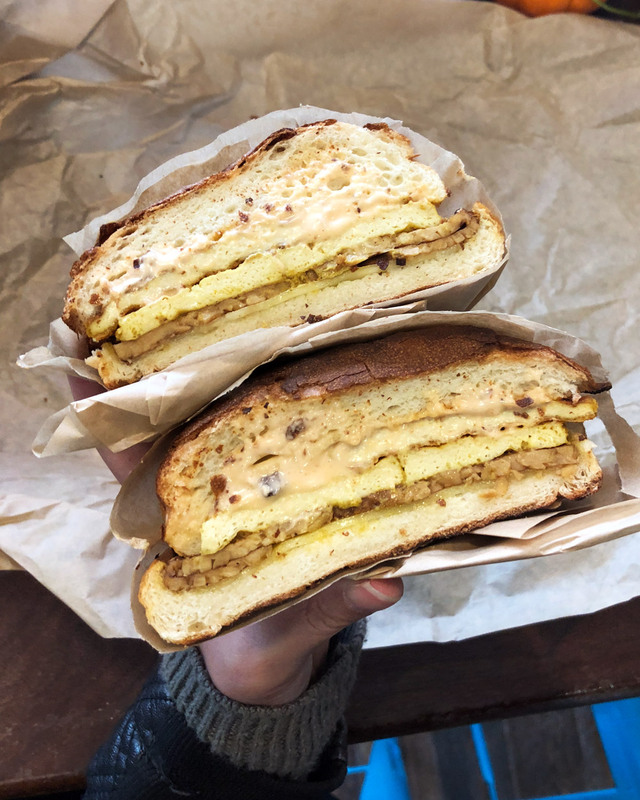 In all my years of chowing down on Terri’s vegan sandwiches, I’ve never had their breakfast sammies. Not bad, not bad. It held up nicely in my backpack, and I’m pretty sure the woman next to me was jealous that I had a snack. Haha, I was there for 4 days! I’m hoping to be back in NYC next year, so I’ll def keep you posted. More vegan lunches for us! I can only imagine how many incredible vegan eats there are in NYC! You had me at those wings, but I have to say that sushi looked incredible too! 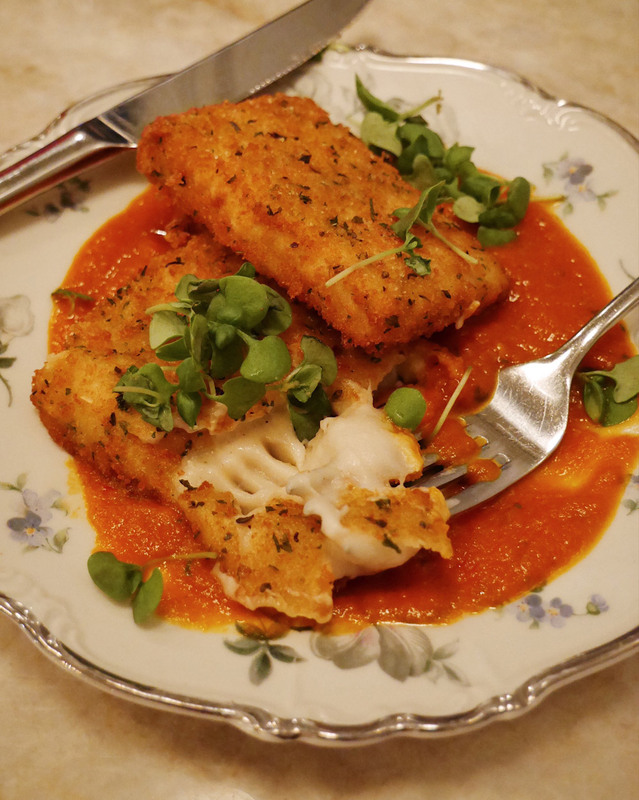 So many gorgeous looking dishes you had! Too many things to eat, not enough time and stomach space! I just ate lunch, but this post is making me SO HUNGRY. I used to live in New York, too, but didn’t go to any of these spots. (I lived there a long time ago.) I’m pinning this for my next visit back! 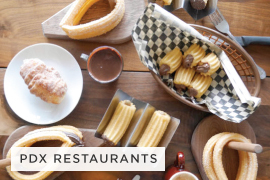 The food scene there just keeps getting better and better. You’re gonna love it next time you’re there! Those all look so tasty! Butchers Daughter in SoHo is one of my favorite vegan places to stop by! I didn’t get to visit the Butcher’s Daughter on this trip, but it’s a good one for a casual lunch and fresh juices! What a wonderful variety you managed to squeeze in your visit- and holy moly each day 20,000 steps per day would have left me more exhausted then hungry! 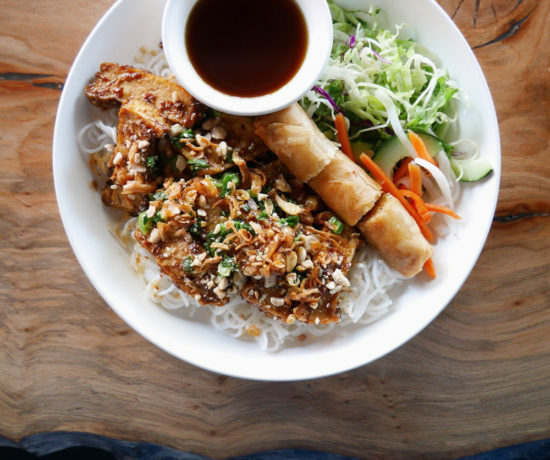 Talk about a real food crawl! 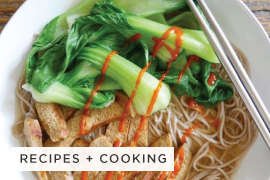 I seriously want every single dish on your list! That colorful sushi looks particularly delicious as does the breakfast sandwich! What a great lineup of vegan eats in NYC Waz! what an awesome food tour! That ramen looked delicious! 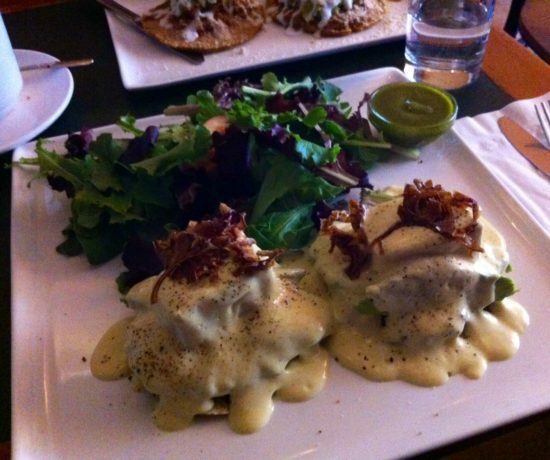 It must be so nice living in NYC if you’re vegan – so many great options! Oh my goodness, that was a lot of (delicious) food! I went to NYC for the first time a couple years ago to visit an old friend who moved there and the one thing that I noticed and loved most was all the amazing food! 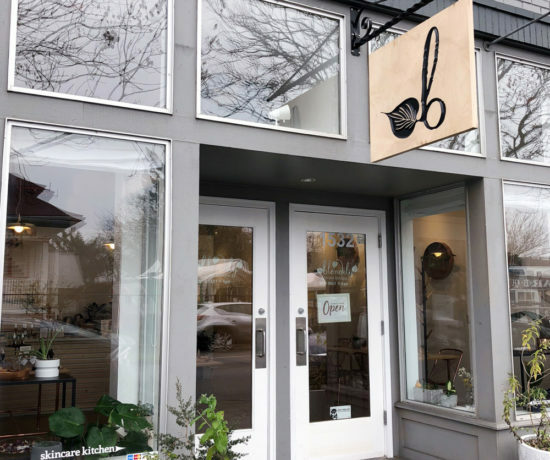 These all look like great places to try (and I’m not even vegan! ), so next time I go and visit her I’ll have to keep these in mind! Thank you for sharing! All that delicious, beautiful food!! I don’t know what I’d try first, but I’d definitely love to check out Beyond Sushi – those rolls look amazing!